Smartphones and GPS devices make it easy to get around, but they can also inhibit your natural sense of direction if you rely on them too much. If you want to be a master navigator of an area, you need to put the screens away. Dr Brendan Kelley, a neurologist at Ohio State University Wexner Medical Center, explained to Christopher Mele at The New York Times that GPS devices and smartphones act as mental crutches. Basically, the more you rely on GPS the less likely you are to actually learn the area and be able to navigate it on your own. GPS might get you somewhere faster, but if you didn't have it, you'd probably be completely lost. Several studies seem to suggest similar conclusions. 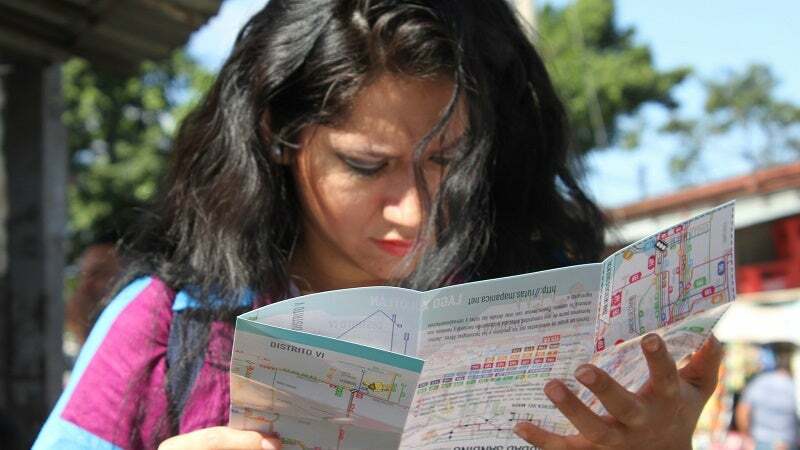 One study, led by Toru Ishikawa of the University of Tokyo, found that people who used GPS while on foot drew far less accurate maps of the routes they had taken. And another study, led by Stefan Münzer of University of Mannheim, suggests using traditional maps instead of GPS makes it more likely you'll remember important navigational landmarks. So, if you want to develop a better sense of direction, stop looking at your screen and pay attention to the features around you, learn to orient yourself without GPS and maybe even consider using an old-fashioned map when you first arrive in a new area. They offer a larger view of where you're headed, and tracing along with your finger can help you mentally plan out your route. Then, after you have your bearings, go back to your GPS so you can speed up your travel times. Best to use both GPS and maps.